In recent months, former Jefferson Airplane lead singer Grace Slick has been touring the US exhibiting her artwork. Grace Slick began painting in 1989 after her last performance with Jefferson Airplane as part of a reunion tour. In the late 1950s, after she left Finch College in New York, Grace briefly studied art at the University of Miami. Apparently her desire to be an artist remained with her throughout her musical career. And memories of her career in music have apparently remained with her and influenced her during her career as an artist. Much of her artwork seems to make reference to her time as a singer and songwriter. As with her song "White Rabbit", Alice in Wonderland references are dominant in her artwork. Images of Alice and the White Rabbit appear often in her paintings. 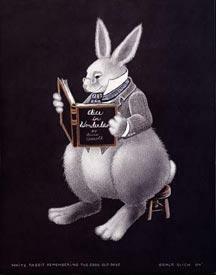 The image posted here is "White Rabbit Remembering the Good Old Days" by Grace Slick. Her paintings also include other musical and rock icons such as Janis Joplin, Jerry Garcia, Pete Townshend, Jim Morrison, and Sting. Saturday, February 17th, 6-9 p.m.
Sunday, February 18th, 12-3 p.m. Links to artwork by Grace Slick and other celebrities at the Pop Life Art homepage.